Hi, I’m Chris Maka (pronounced MAY-kuh, not MAH-kuh), and what I am is a pretty generic 40-something (married, straight white male) comic book fanboy. If you made a list of 30 assumptions about my entertainment tastes based on what I just told you, there’s a good chance most of them would be correct – although I’m weirdly idiosyncratic in ways that I will no doubt reveal here on The Fifth World. I was born and reared in rural Michigan farm country, with a father and cousins who love to hunt and fish and work on cars and things like that. 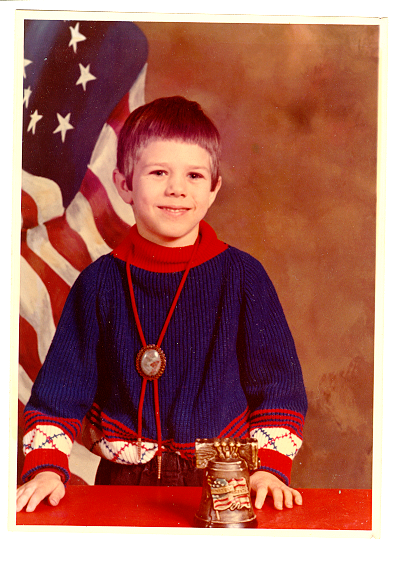 For whatever reason, that was not really me as a boy (and I still hate working on cars). I was always socially awkward and frequently sickly as a child. My first and favorite escape was comic books – mostly superhero comic books, which, of course, meant Marvel and DC superhero comic books back then). Cartoons were important too – “good” cartoons like “Super Friends” or “Speed Racer” – but limited to Saturday mornings and occasional afternoons after school (the local stations tended to randomly rotate what they showed in the after school slots). Comics, though, once you had ‘em were always there when you needed ‘em. 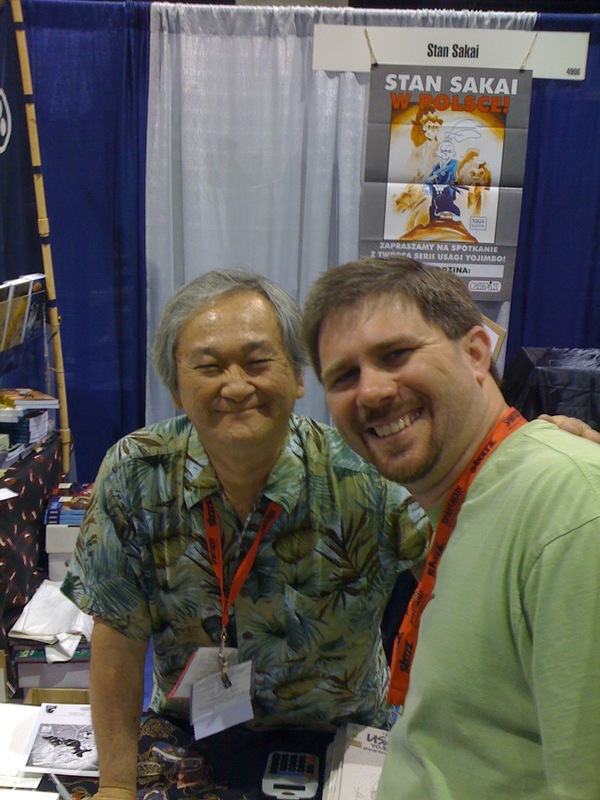 Me hanging out with my close, personal, friend, Stan Sakai, in San Diego several years ago. I started out a DC guy because of “Super Friends”, but I quickly discovered and fell in love with Marvel as well. Ever starved for more material, “Marvel versus DC” tribalism never occurred to me. Besides superheroes, I liked “Speed Racer” and “Battle of the Planets” (the horribly Americanized version of Japan’s “Gatchaman”), and Godzilla movies that local TV showed on Sunday afternoons opposite golf and bowling. But I also liked baseball and football, GI Joe, daydreaming, Happy Days, Sesame Street and Electric Company. I was more than a little odd, but not specifically geek obsessed. That all changed with “Star Wars”. “Star Wars” was a revelation for me, and I mean that in the religious sense of the word. Aside from being the most entertaining experience of my short life, it was mind blowing – I genuinely, I kid you not, felt my mind being expanded as I watched it. Ideas and possibilities and dreams that I had never considered before felt suddenly real. I needed more. Things exploded at that point. Within weeks, thanks to a friend at school, I discovered the Legion of Super-Heroes, the first comic book that I became genuinely obsessed with versus simply liking a lot. Over the next few years these would be followed by the Rankin/Bass “The Hobbit” and “The Return of the King” animated features, (and reading the actual The Hobbit book – The Lord of the Rings I wouldn’t make it through till college), the “Starblazers” cartoon, “Battlestar Galactica”, and the Uncanny X-Men comic book. In the early 80’s my family moved to the south Texas coast (the recently-leveled Rockport, Texas, in fact). After the move I got into Dungeons & Dragons followed by numerous roleplaying games, video games, The New Teen Titans, Daredevil, Michael Moorcock’s Elric of Melnibone’ stories, Roger Zelazny’s Amber stories, Rush and Pink Floyd, 80’s movies, and on and on and on. After college (double-major, English and Anthropology) I got into the fledgling world of website development (mid-90’s). Then I went to art school in Denver, and after that I got into video game development, beginning with NCsoft (I got to work on “City of Heroes”, among other games, which was a real treat). I also got to work for Steve Jackson Games for a couple years in the mid-2000’s. Now, with the help and support of my wonderful wife and daughter, I am making some life changes to finally make a serious go at an art career. American comic books of all genres (I’ve expanded my tastes over the years, through deliberate effort on my part) but yeah, superheroes. Movies and television, particularly the stuff you’d expect: fantasy, science fiction, superheroes. Written fiction, especially fantasy and science fiction. Video games – less console and more PC and mobile these days. World mythology, and religio-magic systems. Geek culture, particularly conventions and online communities.